I’m declaring this cod dish a perfect recipe for January. It’s lean and not too indulgent, but the smoky pimenton will help warm you up if your weather is a bit chilly as it is here. Just smelling the lovely pimenton in the simmering sauce makes the house seem warmer. And, this is a pretty quick dish to prepare if you’re looking for simpler meals after lots of holiday cooking. It’s from Cúrate: Authentic Spanish Food from an American Kitchen by Katie Button, and I received a review copy. Katie Button’s career in cooking began after she first studied biomolecular engineering. Rather than completing her PhD program, she opted to go to work for Jose Andres in Washington D.C. That position led to a stage in elBulli’s pastry kitchen which was followed by opening a Spanish restaurant with her husband in North Carolina. The book is named after the restaurant, and both offer home-cooking from all the regions of Spain with some interpretations for what’s available here in the US. There are classic dishes like Gazpacho, Tortilla Espanola, and Sauteed Shrimp with Garlic as well as fresh ideas like Roasted Beet Salad with Candied Orange, Manchego, and Marcona Almonds. One section that really got my attention was Sandwiches. The wonderful preserved products from Spain are mentioned in a few places in the book, and they come into play with some of the sandwiches. For instance, the Tuna Sandwich is made with homemade Arbequina Olive Oil Mayonnaise, canned Navarra white asparagus, roasted piquillo peppers, tuna jarred in olive oil, and sliced hard-boiled egg on split baguette, and it looks delicious. The very next chapter is Desserts, and I’d love to try them all. The White Chocolate Saffron Roulade may become my birthday cake this year. And, the Frozen Meringue with Candied Marcona Almonds and Grand Marnier sounds delightful. 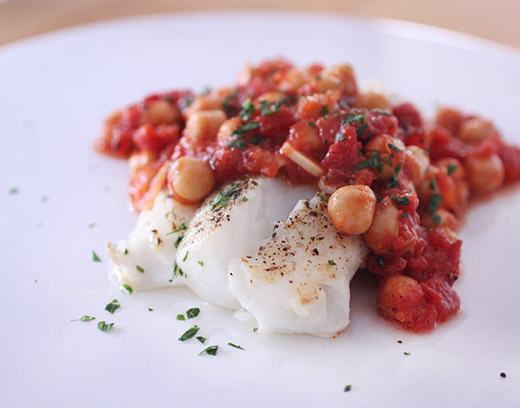 First, I tried the flaky cod with the hearty, chunky sauce with garbanzos. Seafood stock is called for in the recipe for the sauce. I usually have some shrimp shells in the freezer and whip up some seafood stock fairly quickly. However, there is a lot of great flavor in the other ingredients, and water would work instead of stock. To begin, garlic and onion were sauteed in olive oil until golden, and canned crushed tomatoes, a bay leaf, and a sprig of rosemary were added and left to simmer for a few minutes. Next, the stock or water and rinsed and drained canned garbanzo beans were added with smoked pimenton. The mixture was brought to a boil and then reduced to a simmer for another few minutes. Last, chopped parsley was added. The cod was simply seared in a skillet until just cooked through. The fish was served with the sauce spooned over and around each piece. Sauteeing onion and garlic makes the kitchen smell amazing, but adding the smoked pimenton took it to another level. With the garbanzos in the sauce, this was a hearty but not too filling dish all at once. Like the other recipes in this book, this was straightforward to prepare with some smart touches to bring about great flavor. It’s a nice guide for bringing Spanish dishes to your table. So very fresh and gorgeous flavour, Lisa. Cod fillets are so very tender and that sauce is totally irresistible. Hi Lisa, your post prompted me to do a little research about pimenton- looks like it is an essential ingredient in Spanish cooking and that there are several kinds of this spice. 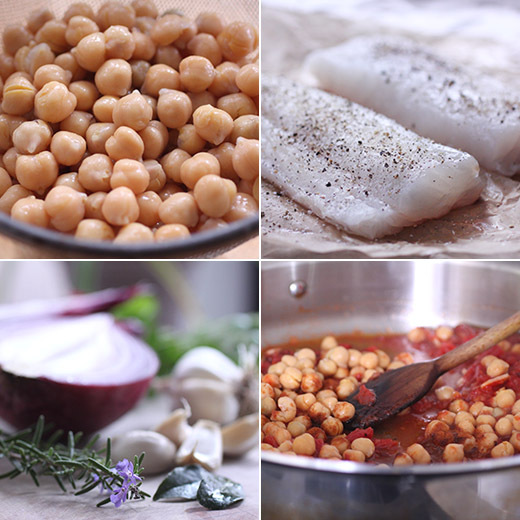 Adding garbanzo beans with the cod certainly makes for an interesting combination of textures! that's the whitest fish i've ever seen, and it must taste pretty darn good with that sauce! This is the perfect meal, love the sauce and the preparation. Happy 2017. This looks terrific! Love garbanzo beans. In fact had them in a soup tonight (with sweet potatoes and tomato). 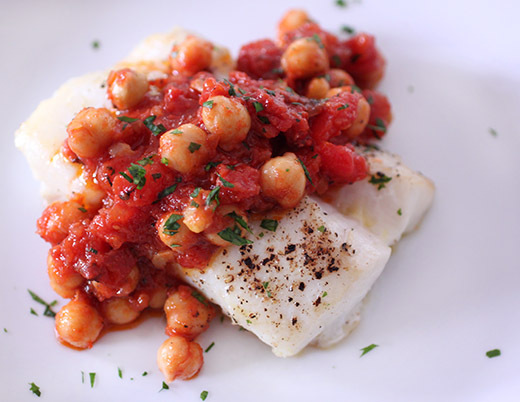 Like the idea of combining them (and tomato) with cod -- sounds really tasty. Thanks! Love the bright color the sauce adds to this otherwise white piece of fish. Sounds like a nice dish to try. Looks like a great recipe, Lisa. Healthy, flavorful and such great color!